Since 2003 my group has been conducting a set of long-term observations and experiments up at the Rocky Mountain Biological Lab. It is a fantastic place filled with an impressive set of visiting scientists and colleagues as well as a diverse, lush, and striking mountains. It is typical Colorado – g reen and filled with flowers in the summer. However, during the summer of 2012 Colorado was uncharacteristically brown and crispy. One of the questions that we are investigating is how will climate change influence these lush alpine ecosystems and their biodiversity? We just published a paper that helps us understand just what the future holds for the mountain ecosystems of Colorado and the Southwest. Climate in subalpine meadows of the Rocky Mountains can be characterized by an early (foresummer) drought that occurs after snowmelt (May) and lasts until the start of the summer monsoon season (July). Dr. Lindsey Sloat lead a team through a series of experiments and long-term monitoring of subalpine and alpine ecosystems to help solidify our understanding that Colorado’s high alpine ecosystems are sensitive to snowmelt date and the duration and intensity of drought that can occur before the start of the summer rains. The Rocky Mountain Biological Laboratory (RMBL) in Gothic, Colorado (elevation 2900 m), experienced a strong foresummer drought in 2012. This drought was caused by a shift in the jet stream, high temperatures, and a reduced snowpack. A shift in the jet stream led to a combination of factors that led to an historic drought – reductions in snowpack in the mid-latitudes as well as a reduction of summer rainfall before the July Monsoons (see here for more info). During 2011-2012 Colorado and much of the western United States experienced an intense drought. This was the type of drought that is predicted to occur more frequently in the future (read here for a good overview). During 2011-2012, the total snow accumulation during winter was 640 cm, which is about half as much as average (1,117 cm). Also, snow melt was much sooner – the date of first bare ground was April 23rd, about a month earlier than average (May 21). The early season also experienced higher than average temperatures, which dried out the soil due to increases in evaporation. The total growing season precipitation in 2012 was 34% of average. To understand how variability in the timing and strength of the foresummer drought affects the functioning of Colorado’s alpine, graduate student Lindsey Sloat conducted an experiment via measures of ecosystem carbon exchange and plant water status. Lindsey (and now PhD! ; see picture in this post) spearheaded a watering experiment during the summer of 2012. It turned out that 2012 was a big drought year. The watering manipulation was designed such that the un-watered ‘‘control’’ group served as the most severe drought treatment, and three other treatment groups incrementally decreased the length andseverity of the dry period (the time between snow melt and the start up of the summer monsoon rains). Here is our lab group out measuring how much carbon dioxide a 1.2m x 1.2m plot of meadow can absorb. In the center of the plot is an infrared gas analyzer. We then lower the tent over the analyzer creating a sealed chamber. We then monitor how fast the CO2 changes inside the tent. If the plants are happy (having access to plentiful soil water) they are able to photosynthesize at a high rate which would then ‘scrub’ CO2 out of the air in the tent and lower the concentrations of CO2. If the plants are drought stressed then they cannot take in as much CO2. 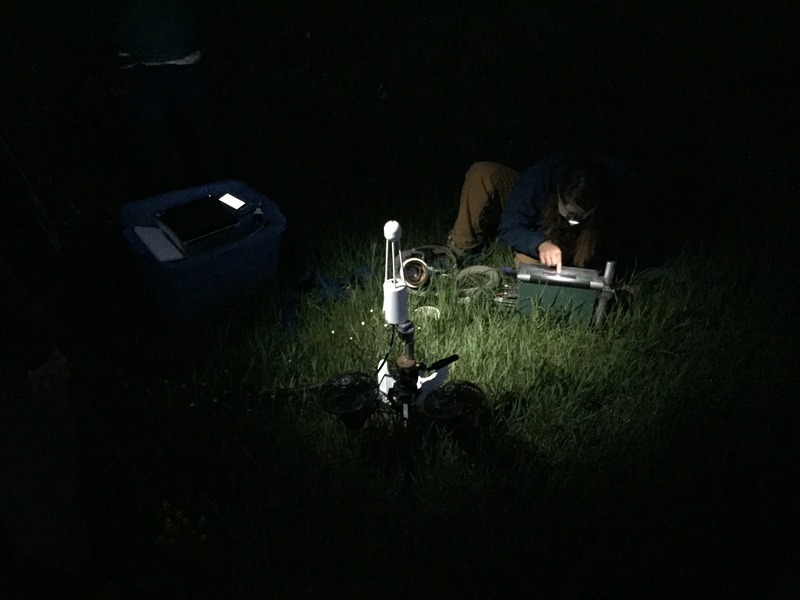 We measure CO2 exchange along the elevation gradient at night too as well as out of the soil. This tells us how much CO2 is returned back to the atmosphere. If the plants take in more CO2 than is released by respiration then the ecosystem is helping to scrub the atmosphere of CO2. Here we are about to start our night measurements. 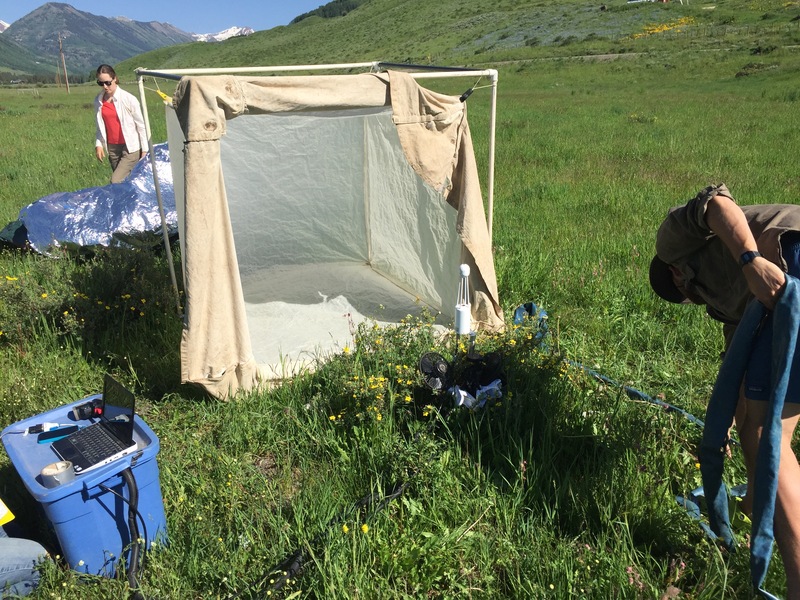 We also have been measuring ecosystem carbon exchange in the experimental plots and along an elevational gradient in and around Crested Butte and RMBL. From drier low elevations to the moist and cool high alpine, since 2003, we have measured how much carbon coming in and out of these ecosystems to provide a measure of their functioning within and across years. The more carbon that these meadows take in the more food that is available for the insects, microbes, and animals that depend on these meadows. Also, more carbon uptake provides more of a buffer from climate change. How did we measure how much carbon was going in and out of these ecosystems? We used a Li-Cor 7500 infra red gas analyzer. We placed the analyzer in a flux tent that was placed over our study plots. The tent was designed to let in 75% of photosynthetically active radiation. The air inside the tent is well mixed by fans. For each measurement the tent is lowered over the analyzer and the air inside the tent is sealed from the outside using a long, canvas skirt along the base that is covered with a heavy chain. This allowed us to measure how much carbon dioxide the meadows and ecosystems were taking in. We have done this measurement countless times – within years, between different sites, and between years (click here to watch us at work via the National Geographic Channel at 50.40 and 55 minutes into the show). Over the years, we have monitored the meadows along an elevational gradient – measuring a lot of carbon fluxes! Figure 1 from Sloat et al. 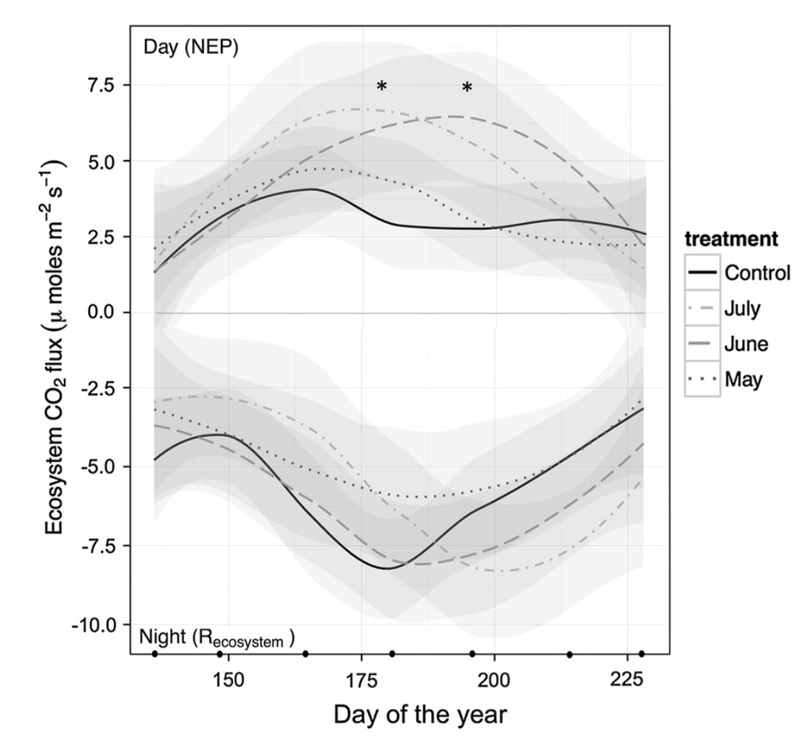 Daytime (top) and nighttime (bottom) ecosys- tem CO2 flux rates for each experimental treatment over the growing season. Black dots along the x-axis show measurement times. Shadows represent 95% confidence intervals for the five replicates of each treatment. Lines are smoothed using a loess function. Daytime—the plots watered through June or July have significantly greater rate of daytime CO2 flux (NEP) during the peak of the growing season than the plots watered only in May and the control plots (ANOVA, df = 1, F = 4.956, P = 0.0398), denoted by asterisks. There is no difference between treatment groups during the last time period (ANOVA, df = 3, F = 0.344, P = 0.79), sug- gesting that treatment did not influence the length of the growing season. Nighttime—there were no significant differences between treatment groups for nighttime ecosystem respiration (ANOVA, df = 1, F = 0.096, P = 0.76). Experimental Results – The watering treatment significantly increased the soil moisture of currently watered plots – that is, watering made plots significantly more wet. As a result, more moisture influenced how well the vegetation could uptake carbon dioxide. Manipulating the strength of the foresummer drought by adding additional water right after snow melt during an extreme drought year revealed that the timing of growing season precipitation is more important for the functioning of ecosystems than the total amount of precipitation during the entire growing season. Plants that experienced a strong foresummer drought exhibited more water stress, and lower rates of carbon uptake from photosynthesis, even during the rainy season. Analysis of variation of ecosystem carbon exchange in our 11-year dataset along an elevational gradient shows that that the strength of the fore summer drought (how much rain falls between snowmelt and the timing of the first summer rains) does influence the peak rate of carbon exchange. As June conditions become drier, the peak ability of the ecosystems in the Colorado alpine declines during the ‘peak’ season in July and August: or approximately 8 weeks after local snowmelt when the vegetation is tallest, the summer rains have started, and soil moisture is relatively high. Interestingly, snowmelt date strongly influenced peak season ecosystem uptake —explaining 71% of the variation in ecosystem metabolism. Years with earlier melt dates had lower peak season carbon uptake. In other words, an early spring and hence a dry start to the summer means that when the rains finally do start in the summer the ecosystems do not fully recover. As a result, Colorado alpine ecosystems do not take in as much carbon dioxide which means that they do not provide an important buffer to climate change. A figure from Sloat et al. showing that as the severity of the fore summer drought increases (more negative Palmer Dought values and earlier snowmelt dates ) the net carbon uptake by mountain meadows decreases. These graphs also show that the impact of the drought is the greatest on the higher elevation (the normally wettest) meadows and alpine. What do the climate change forecasts show for the future low snowpack, and high temperatures? The most recent global climate forecasts (see here and here) for Colorado and the southwest United States predict a shift toward lower snowfall, earlier snowmelt, and faster runoff. These conditions are expected to become widespread by the late Twenty-first century. Together, these changes would increase the length of time between snowmelt and the occurrence of the summer monsoon, or the ‘foresummer’ part of the growing season. Our results paint a potentially grim future for the lush green alpine of Colorado and the mountains of the Southwest United States. The foresummer drought is critical in determining rates of carbon exchange throughout the growing season, and the future forecast for increased fore summer drought would negatively impact the balance of carbon in subalpine meadows – especially the highest elevation – under future climate change. Ault, T. R., Cole, J. E., Overpeck, J. T., Pederson, G. T., & Meko, D. M. (2014). Assessing the risk of persistent drought using climate model simulations and paleoclimate data. Journal of Climate, 27(20), 7529-7549. Diffenbaugh, Noah S., Martin Scherer, and Moetasim Ashfaq. “Response of snow-dependent hydrologic extremes to continued global warming.” Nature climate change 3.4 (2013): 379-384. Sloat, L. L., Henderson, A. N., Lamanna, C., & Enquist, B. J. (2014). The effect of the foresummer drought on carbon exchange in subalpine meadows. Ecosystems, 18(3), 533-545. Underwood, E. (2015). Models predict longer, deeper US droughts. Science, 347(6223), 707-707.